Vice President Joe Biden doesn't seem to miss his days as a senator. In an interview with CBS "Early Show" co-anchor Harry Smith, Biden was blunt about the nation's political system. "Washington, right now, is broken." Having served in the Senate for more than 30 years, Biden has seen a fair share of gridlock in Congress, but the current version is the worst ever, he said. "I don't ever recall a time in my career where to get anything done, you needed a supermajority, 60 out of 100 senators. You can block anything with 60 (votes). "I've never seen it this dysfunctional," he said. In light of the surprise Republican victory by Scott Brown in the race to replace the late Sen. Ted Kennedy's senate seat in Massachusetts, Biden said the win was not solely a warning shot to Democrats. "I think it was to everybody in public life, and it was, 'Hey, guys, get your act together. Get something going.'" According to a recent CBS News/New York Times poll, most Americans are dissatisfied or angry about the way things are going in Washington these days. Eight in 10 say Congress is more interested in serving the needs of special interest groups rather than the people they represent. But only a third of people feel the same way about President Obama. Nearly 60 percent think he is more interested in serving the American people. 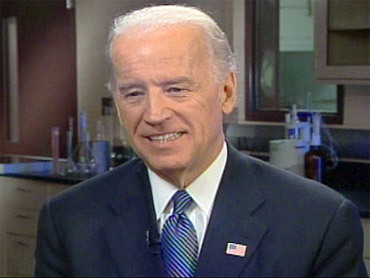 The interview also covered the Biden's take on the future of the economy and national security. The vice president rang an optimistic tone on the economy, saying the stimulus plan was working and that the best was yet to come. "We've only been halfway through the act," Biden said. "The job-creating portions are really loaded at the second half." With the unemployment rate still close to 10 percent, Biden said he understands why Americans are frustrated and have criticized the administration for spending too much time on health care reform. "We get it," he said. "We understand why they're angry." On terrorism, the vice president says the Obama administration has made "progress in dismantling the hierarchy of al Qaeda," but he's "very concerned" about the possibility of an individual carrying out a terrorist attack in the United States.